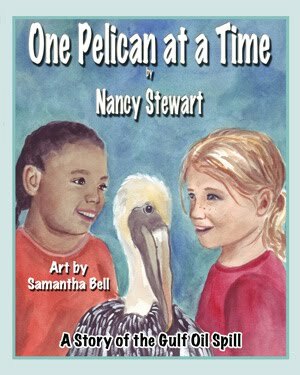 One Pelican At A Time: A Story Of The Gulf Oil Spill is a children's picture book concerning the environment and how even a child can help. Britt and Bella, two little girls who live near the beach, are concerned one day when oil begins to wash up on the shores. Watching as the drama unfolds around their home, the girls become frightened when their favourite pelican becomes covered in oil. With no time to spare, the girls decide its time to help and with their quick thinking the girls learn how to help the animals that are washed up and covered in oil. The Gulf Oil Spill will live with them forever and the lessons they learn concerning our environment will enable Britt and Bella to react in a positive manner to correct the wrongs that have been occurred. I read this to my 7 year old daughter who didn't understand why we needed oil if it made such a big mess of everything. She was very upset that the animals were often the victims in such tragedies, and proceeded to explain to her younger brother that if there was ever an oil spill they would have to go and save the animals. I do believe she received the message being shared with the reader, no matter how small or young you may be, there is always something you can do to help, if your heart is in the right place. 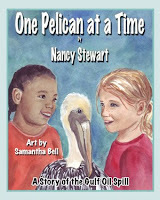 One Pelican At A Time is a very endearing book for young readers, it not only helps strengthen their reading skills but the message is an important one. This book should be in school and public libraries to introduce to youngsters the plight of our environment, how to care for our planet and how fossil fuels can sometimes hinder the good when serious accidents occur. Thanks for reviewing One Pelican at a Time. I'm glad you and the kids enjoyed it. It's an Amazon bestseller, and has been on their Hot New Releases and Most Wished for in children's books lists. I hope your readers will visit Nancy's website at http://www.nancystewartbooks.com/ to learn more about it and her other two upcoming books that feature Britt and Bella. Your 7 year old's testimony is so precious! What a nice review of this special book. Thank you so much for allowing me to visit your lovely blog. So appreciated.